Overseas Filipino Workers (OFWs) may help to prevent the planned increase in Social Security Service (SSS) contribution starting May 2017. The increase is due to approval of P1,000 pension hike for retirees that will be implemented this month. The second tranche of P1,000 pension will be on 2022. According to SSS Chairman Amado Valdez, an increase in membership and contribution from OFWs may help stave off the plan to increase contribution from members by 1.5 percent or, to 12.5 percent from 11 percent. He said this increase will compensate for the increased payouts for the retirees. "If there would be an additional 10 percent or 1.5 million (new members) coming in, we may not be increasing the contributions anymore in the future," Valdez said. Valdez said that while the present contributions and income are enough to pay for the increase, the fund's lifespan will only be until 2032 or ten years earlier than originally projected. He said that the government wants to make SSS membership compulsory for OFWs through legislation. He said this will assure OFWs of protection and will bring in member contributions that "would be very big." 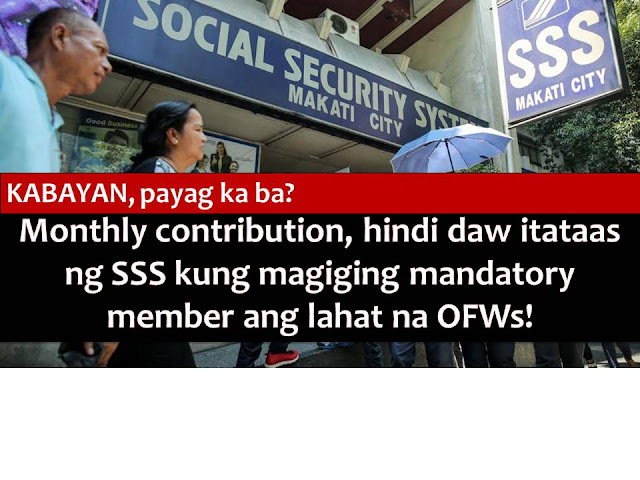 At present, OFWs can be voluntary members of the SSS. According to the SSS, 1.2 million of its 34.6 million members are OFWs. They accounted for P3.2 million, or 3 percent, of member contributions between January and September 2016. On the other hand, SSS President Emmanuel Dooc said the have initially identified ways to widen the network and revenue of SSS. 1) All aspiring government contractors must submit SSS clearance as part of pre-bidding requirements, to ensure that these firms pay contributions for their employees. 2) To make mandatory for every OFW – now classified as voluntary members – to become compulsory SSS members. All OFWs if they become members, could help boost the revenue base, and assure themselves/their families of SSS benefits. 3) All LGUs should observe a strict policy not to renew business permits of firms that cannot issue SSS clearance. 4) All professionals renewing licenses with PRC must also present SSS clearance. He that the SSS will be more secure if it manages to increase membership by 1.5 million. TEXTING, SURFING THE NET WHILE DRIVING? READ THIS "BETTER SAFE THAN SORRY"